When sitting at the poker table, it is important to be aware of your own "table image" and the image of the players around you. Table image is essentially what one poker player perceives another player’s style to be, which is determined by the way they play poker. For example, if a player is not playing many hands and only entering pots with premium starting hands, the other players at the table may perceive that player to be very tight, and thus they will have a tight table image. Consequently, if a player is entering many pots and calling raises frequently, they may be perceived as being a loose player, and thus they will have a loose table image. Your table image is constructed primarily from the way you play poker, but it also can be influenced by the way you conduct yourself whilst you are at the table. It is normal for players to build an image through their individual style of play, whether that be tight or loose, but sometimes what you say or do at the table could potentially overshadow this and portray a different style of play to your opponents. Your table image will be influenced by the way you play your cards the vast majority of the time. If you are loud and talkative at the table, your opponents may feel that you are having a good time and are likely to play a number of hands for the entertainment, and this will create a loose table image. Conversely, if you are quiet and reserved then you may be able to have the other players perceive you as being a tight player. However, the more advanced and observant players will look straight through what you say or do, and let the cards do the talking for when it comes to mentally assigning you a style of play. The importance of table image. Table image is important is because it will influence the way your opponents play their hands against you. If you have a loose table image, you may find that opponents are more willing to get into pots with you because they will know that your starting hand requirements will be lower than that of a tight player’s. If you have a tight table image, your opponents will be more reluctant to get into pots with you because they will fear that you will have a big hand every time you enter a pot. Both of these styles of play have their own unique benefits. The benefit of a tight image. Essentially, the tight table image is beneficial because you are always going to be entering pots with good hands, and therefore if you only play these premium starting hands, it makes sense that you will win more pots than you lose. In addition, your opponents will continually be concerned about the strength of your hand if you have created a tight table image for yourself. Therefore you will be able to successfully bluff your opponents more frequently than if you had a loose image, and pick up the occasional extra pot with the worst hand. The main downfall with having a tight image is that you are less likely to get paid off on some of your big hands because your opponents will believe that you have a good hand when you bet, so they will fold. The benefit of a loose image. Whereas if you are playing tight your opponents will fold when you have big hands, you are more likely to get paid off with these big hands if you have a loose table image. This is because to create this loose image you will have been betting and raising frequently on previous hands, therefore your opponents will know that you cant have a strong hand every time and call you down in the hope that you are bluffing. It must be said however that just because you are playing loosely, it does not mean that you will get paid off on all of your big hands. It simply means that you will get your opponents to call you down with a higher frequency than if you had a tight table image. The main downfall with this image is that you leave yourself open to losing a number of chips whilst trying to create this loose image. By entering a number of pots with substandard hands, you can potentially find yourself in tricky situations with marginal hands and therefore losing chips in the process. As you can see, both the loose table image and the tight table image have their pros and cons. However, it is hard to say which one out of the two of these would prove to be the most profitable in the long run. 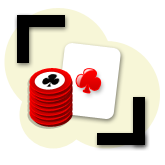 Both of these images and styles of play can be used and employed profitably at the poker table if used correctly. Nevertheless it is fair to say to say that you will experience a greater amount of variance playing the loose style and having a loose image than if you had a tight table image. Both the loose and tight table images have their benefits, but having a loose table image tends to reap greater rewards. You should also be aware that table image is only useful if your opponents are actively taking notice of the way you play. If your opponents are not concerned about the way you are playing, then you cannot create a table image. This is mainly true at the micro stakes where opponents are primarily interested in the way they are playing their own hands. Therefore the importance of table image increase as you move up the stakes and play against more advanced players.